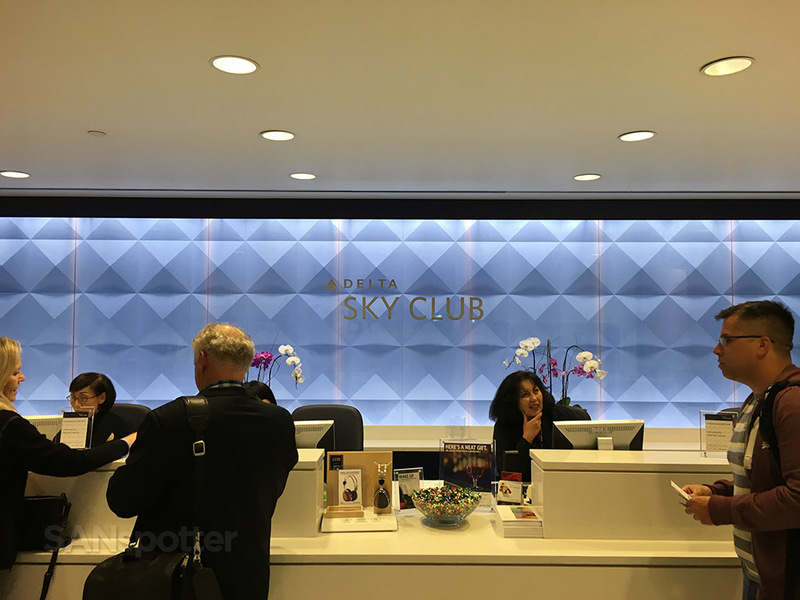 Just as excited as I was to try the Delta One Lounge at JFK earlier in the day (a lounge that didn’t exist), I was excited to give the LAX Delta One Lounge at try before my connecting flight down to San Diego. 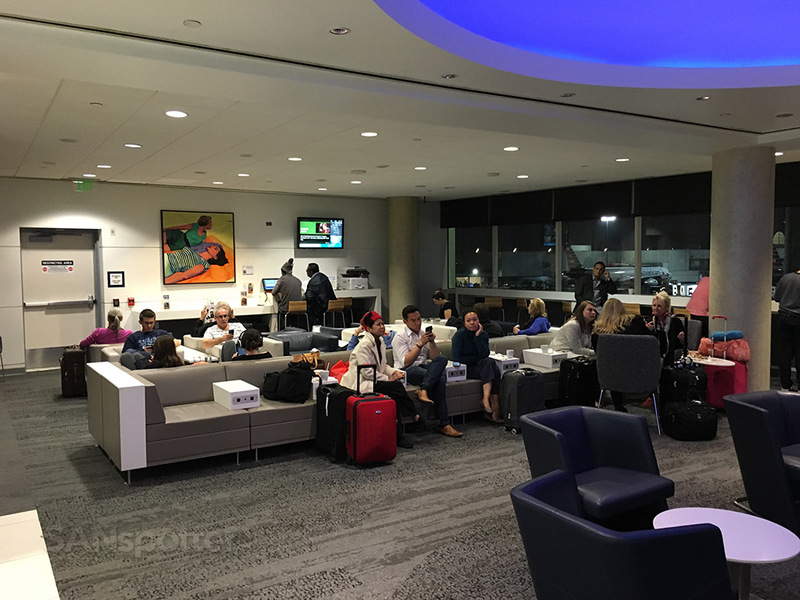 I knew for a fact that there was a Delta One Lounge here at LAX – I’ve seen pics of it for crying out loud – so I knew (without a doubt) that I’d get a chance to check it out for myself. Long story short, it didn’t happen. 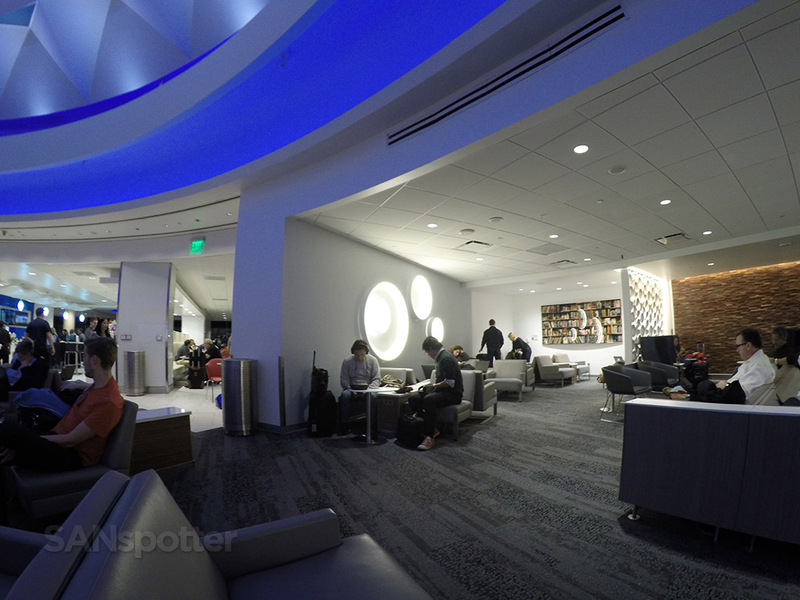 It turns out that the lounge is located outside of security, and since the lines looked long and I was already safely inside the terminal, I decided to forgo the opportunity and settle for the normal Sky Club instead. Thinking about it now, I’m willing to bet that there is some sort of expedited security pass that comes as part of the Delta One Lounge access, so I should have done it. Oh well. 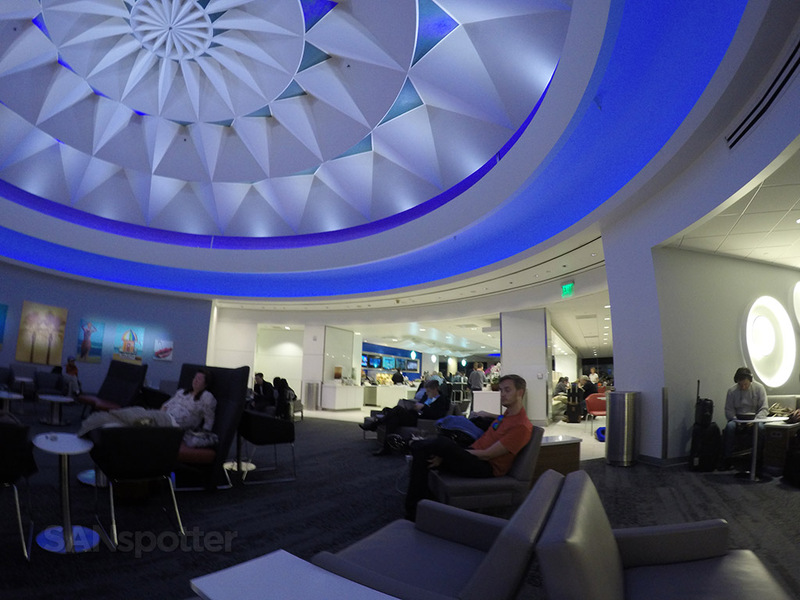 I’ve never tried the Sky Club at LAX anyway so this was a perfect opportunity to have a look. 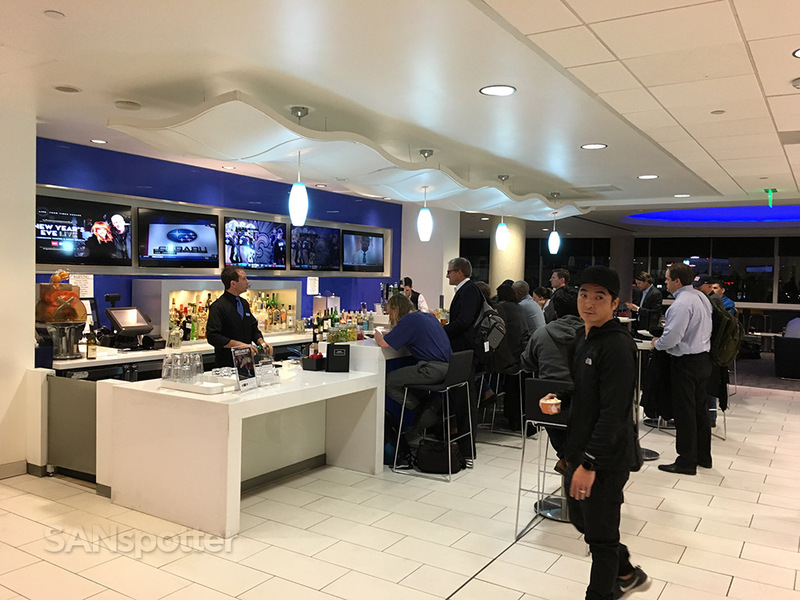 My flight to San Diego would be departing out of terminal 6 this evening, but the Sky Club was actually located over in terminal 5. That meant walking the long and narrow underground connection tunnel, something which I don’t recall ever doing before. Cool! 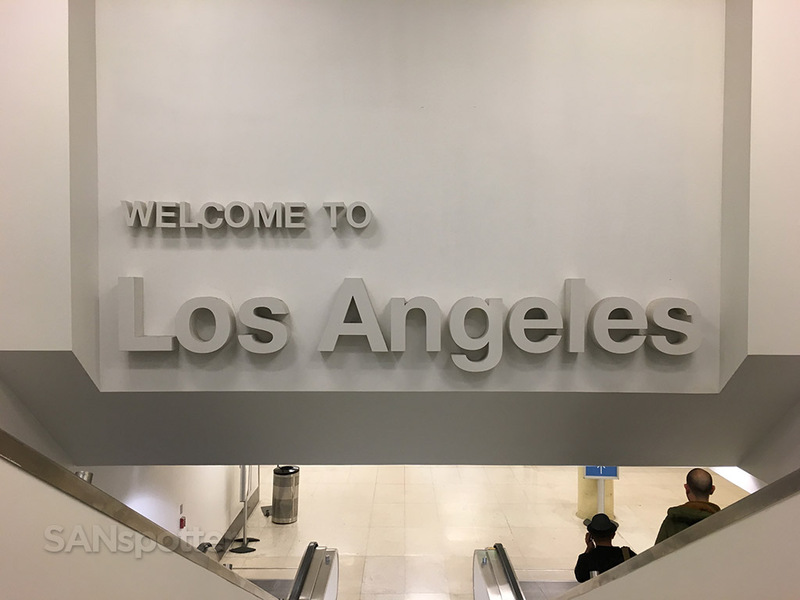 Kind of a weird place for a “Welcome to Los Angeles” sign, don’t you think? 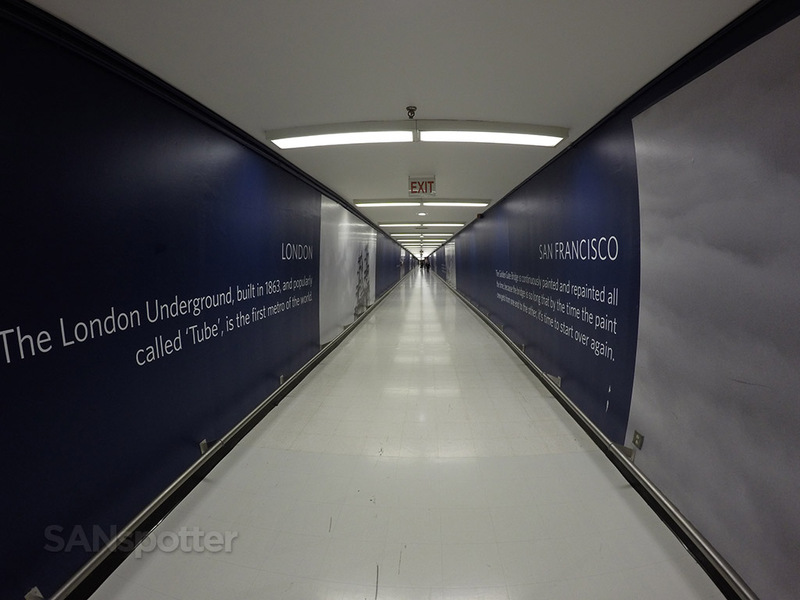 This is the entrance to the underground tunnel. The entrance to the lounge in terminal 5 was a bit hidden, and I ended up having to walk around a bit to find the entrance door. 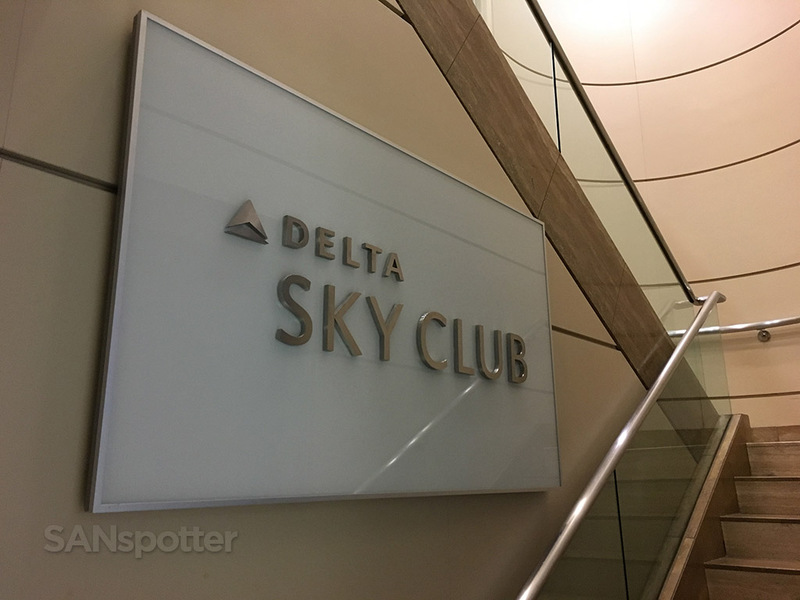 It ended up being a narrow stairway located in a small nook off the main part of the terminal with a small “Delta Sky Club” sign leading the way. 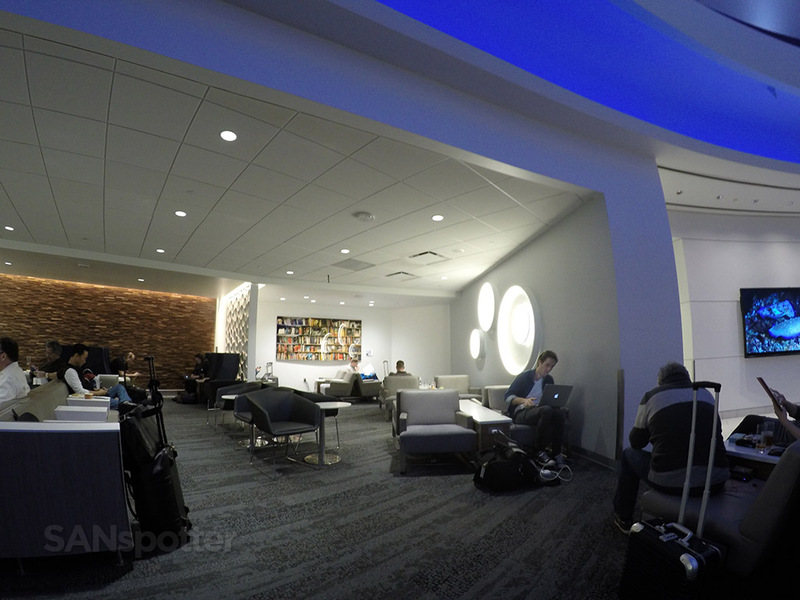 That little nook did look a bit sketchy, but I took Delta’s word for it and made my way up the stairs to the lounge. Once inside, my first thought was simply “wow this place is crowded”. 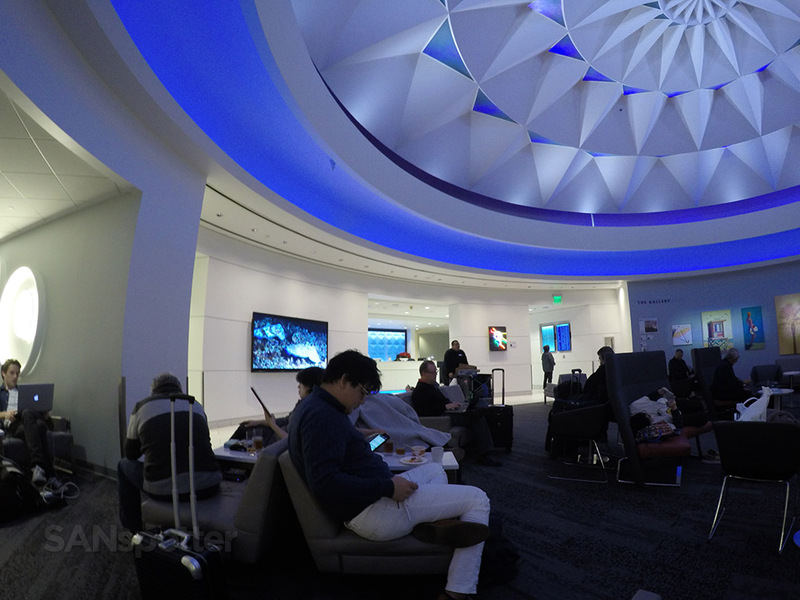 It was so crowded, as a matter of fact, that I momentarily entertained the idea of retreating back out to the main terminal to try and find some peace and quiet somewhere else. But hey – I was on a mission to check this place out and give it a full review for SANspotter.com so I pressed on. …and here’s the view to the right. 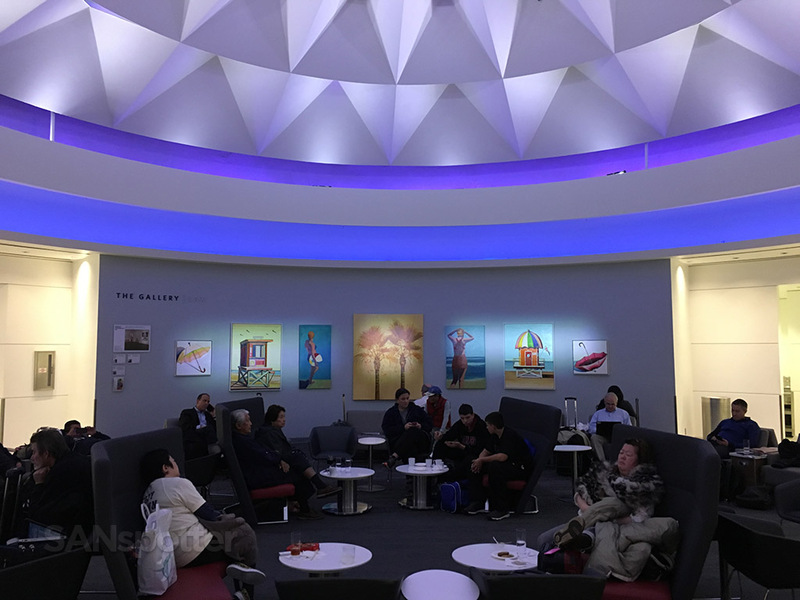 I thought it was quite stylish, though it didn’t quite match the theme of some of the other Delta Sky Club’s I’ve been in. 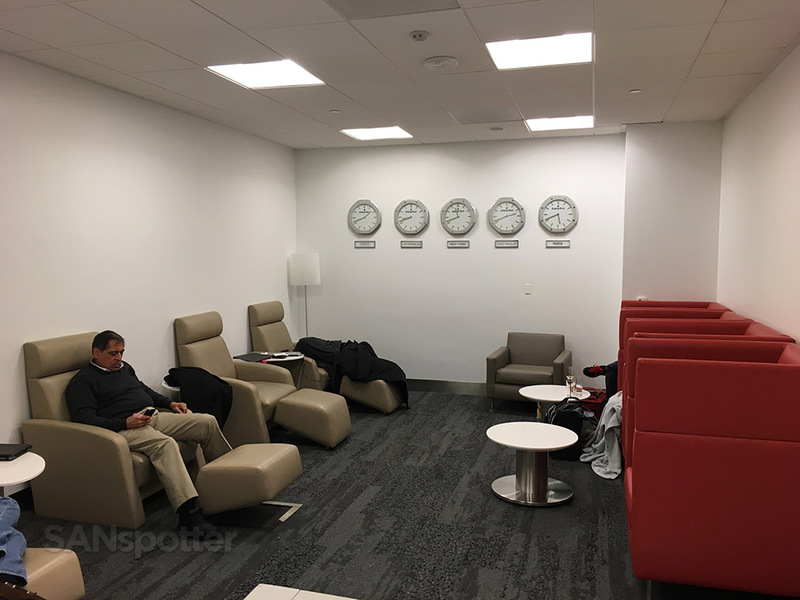 In a nutshell, this LAX lounge is much smaller than the one at JFK (terminal 4) that I spent several hours in earlier in the day. 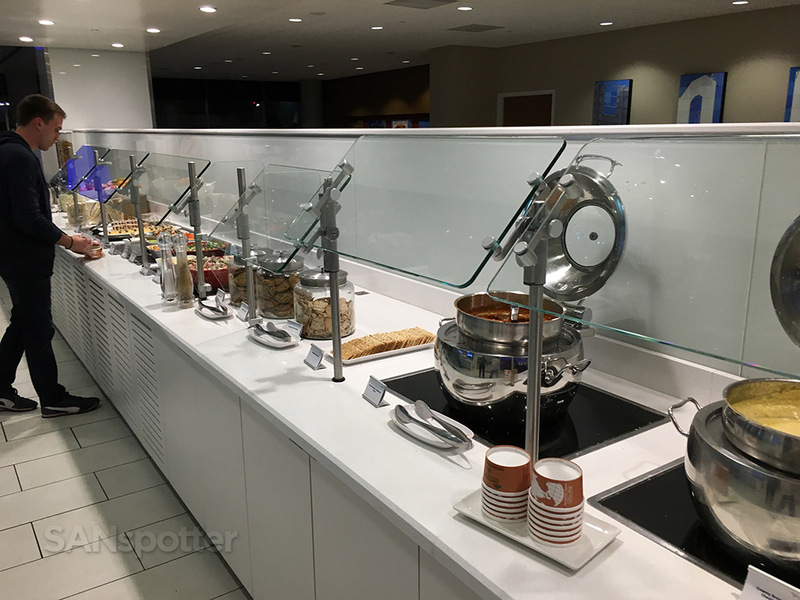 It was certainly nice though – there were several large rooms, each with their own style, along with a full bar and self-serve food counter in the middle of it all. 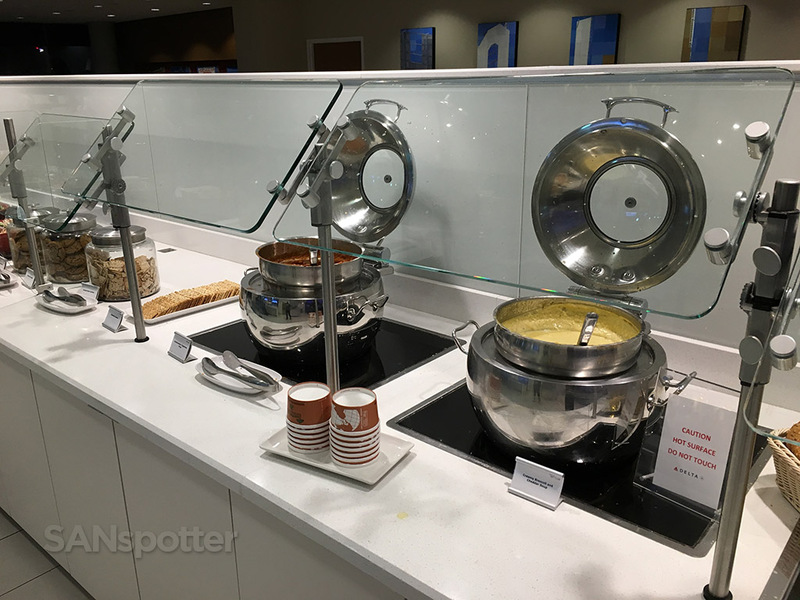 Speaking of food, I found the options to be generous with several kinds of hot soup and an assortment of cold pastas available. It was much better than what I saw at JFK. 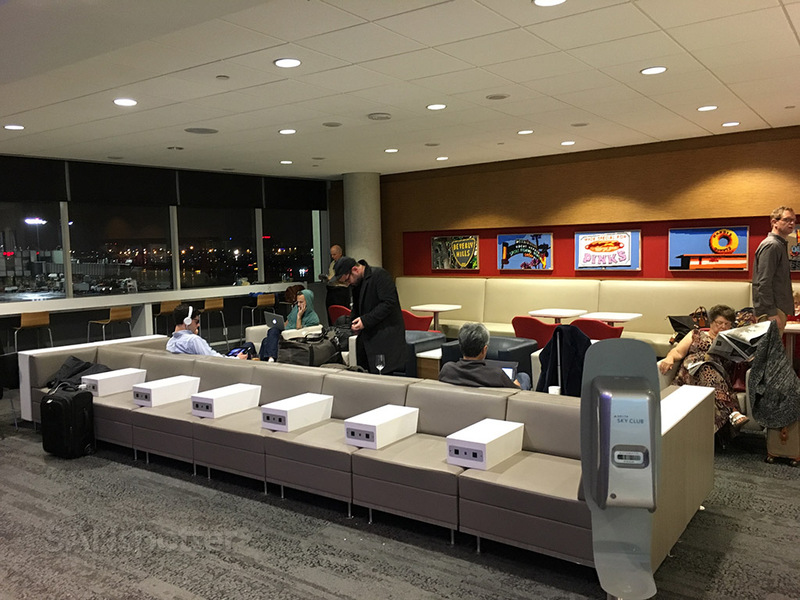 There were a variety of seating options within the lounge. This is the “cafeteria” style seating. Finding a place to sit was a bit of a challenge. Nearly every seat was occupied, so I did my best to wiggle my way into a recently-vacated chair that ended up being where I stayed put for about the next hour and a half. 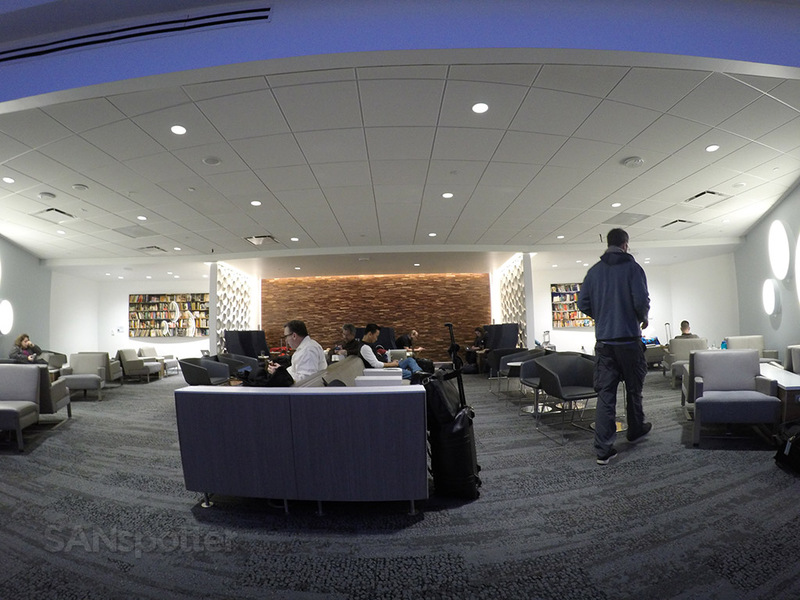 I didn’t intend to stay in the lounge this long, but despite the crowds, it was quiet and comfortable compared to the main terminal below. And this is the view looking right. 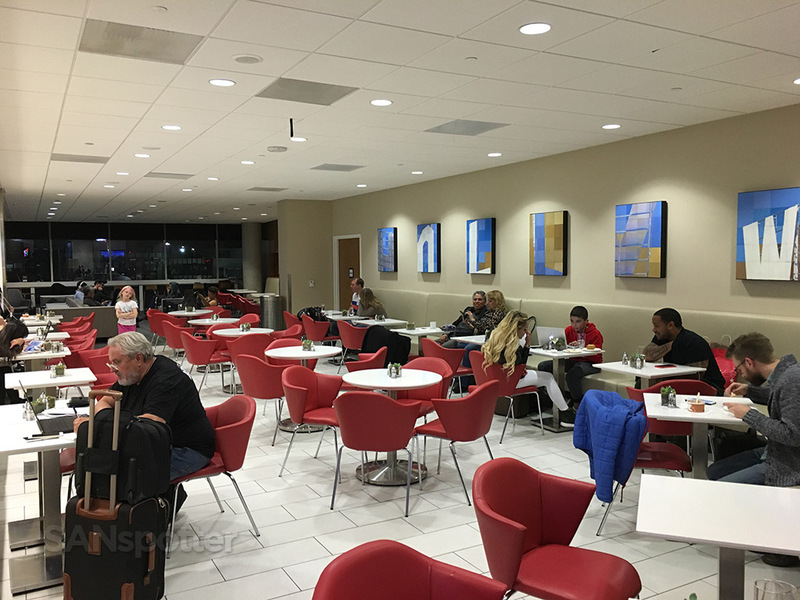 I liked the fact that there were some interesting wall hangings in each section of this lounge. Definitely some interesting things to look at!